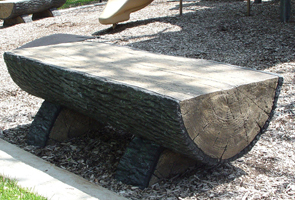 This natural looking rustic half-log bench is ideal for any outdoor setting. Made from glass fiber reinforced concrete (GFRC), this beauty is extremely durable, yet lighter than precast concrete. The color is natural weatherwood as shown, and can vary in shade due to the unique hand application process. This beautiful bench is perfect for any outdoor setting and will add a creative flair to any environment.